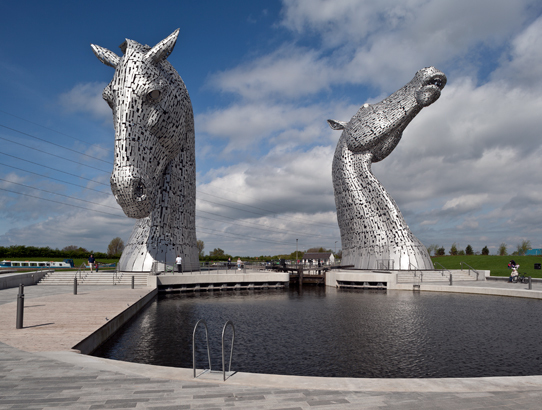 Scottish Sculptor Andy Scott is an awe inspiring artist. Specializing in public art, Scott's pieces often take shape in response to the space and the project scope. The Kelpies, found at The Helix Park in Falkirk, Scotland, are 35m (almost 115 feet) tall heavy horse busts nodding to the industrial history of the country. Thousands of stainless steel, hand cut plates create the outer surface which is supported by an internal column skeleton. When a large design like this becomes a structure, several elements need to be considered, especially weather. 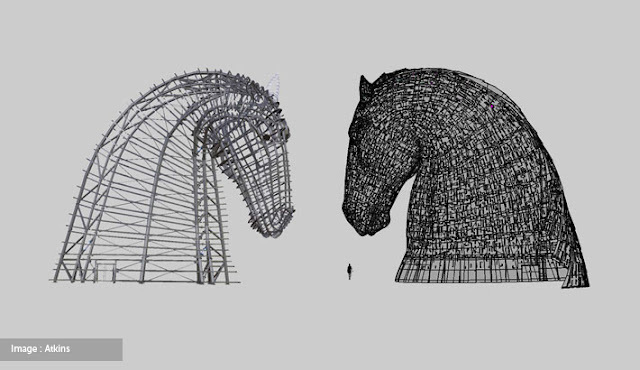 The engineering behind these equine beauties is simply amazing. 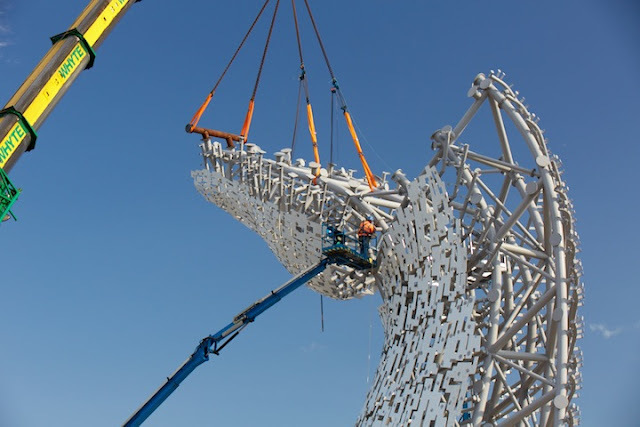 When we think of artists, we rarely think of cranes and construction, but this installation requires hard hats and long arms. It took 5 months to get every piece into place and ready for the public. Creating a lighting plan was an important detail for this sculpture. As it is a part of a public space, planning for visits after sunset was a must. The pieces are lit from below as well as inside the structures. 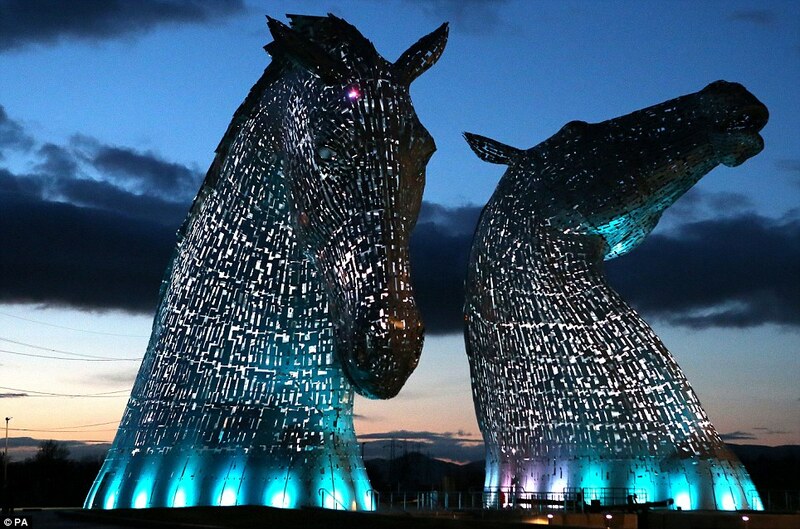 The Kelpies have even gone on tour, on a slightly smaller scale. 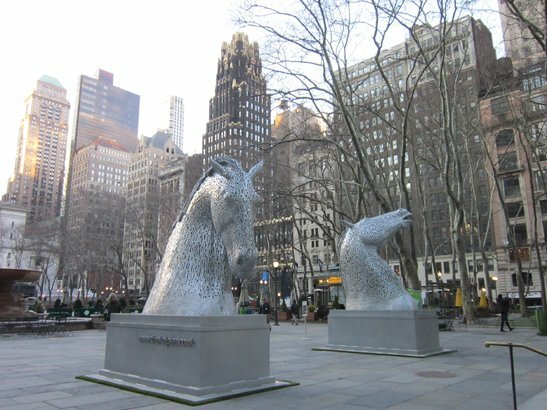 These "miniature" 15 foot versions, still as majestic as the originals, toured the US visiting Bryant Park, NYC for the launch of Scotland Week in March 2014. I am currently working on a residential garden project for which I am introducing the client to Scott's work. I will, of course, suggest something smaller than 35m tall but I know the final design will have just as large an impact.